I haven’t looked at the article, so I’m curious to know what they used as an estimate of IUD failure rate. Because frankly, I suspect our estimates are far too low. Seven months after I got one, I was pregnant. And I’ve met a LOT of women since then who have IUD babies. And here’s the thing about IUDs: as long as they’re intact, you have no way of knowing if they’re failing. If you miss pills, mess up your NuvaRing cycle or break a condom you know it and you can layer on extra contraceptives. Not so with IUDs. I’ve taken to telling people that IUDs are great as long as an unplanned pregnancy wouldn’t be a catastrophe for them, otherwise maybe not so great. IUDs aren’t for everyone though. 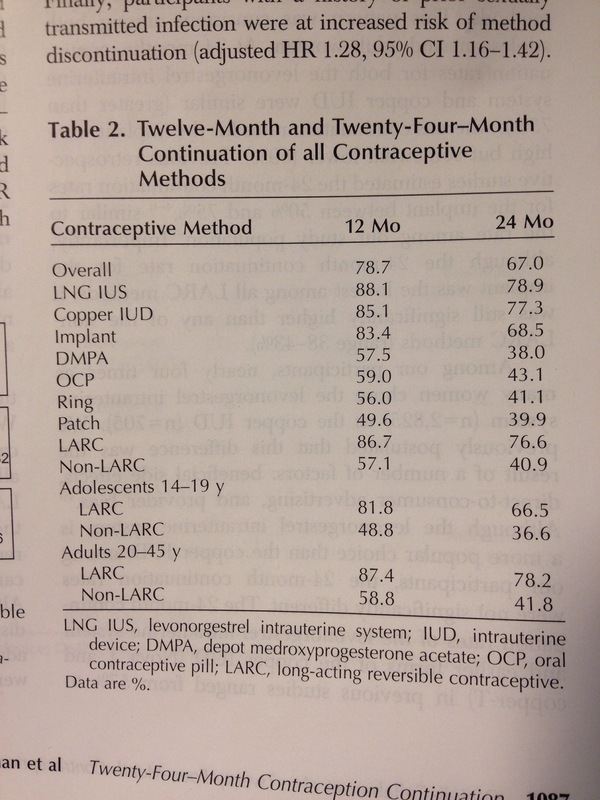 Have been seeing younger patients with PID and IUD use. I thought we were over that but it seems to be coming back on special. Interesting as the studies do not quote a higher incidence if PID out of the post insertion time period of 3 months. Here in the UK LARCs have been recommended ahead of short term options for at least the last decade. It’s been held up as best practice both for the benefits to patients and in terms of cost/efficiency. It’s just a shame that women in the U.S. cannot have their contraception provided free of charge. The cost of devices/medications would be offset several times over by the savings incurred by service users experiencing fewer unwanted pregnancies and their aftermath.